Muma & Flaco Dany dancing at Sunderland, 2001. Muma is a master of dancing tango in the intimate “close embrace” of the milongas and dance floors of Buenos Aires, where she grew up and still lives today. The daughter of a well-established tango family, the likes of Alberto Castillo and Ricardo Tanturi were frequent visitors to her childhood home, and her mother was a singer with the orchestra of Francisco Lomuto. In her own time, Muma has been a cherished dance partner of several of the most renowned + influential social dancers of her generation — among them, Osvaldo Natucci, Fernando Hector Iturrieta, and Dani “El Flaco” García — and with these and others, Muma has helped create a vital “living bridge” between the Golden Age of tango’s storied past, and the dance we continue to explore, create and enjoy together today. 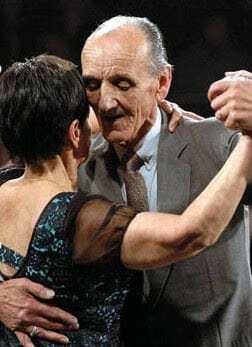 In this regard, , Muma is perhaps most widely known for her many years of dancing and teaching with the legendary milonguero Ricardo Vidort, who began as a teenager in Buenos Aires in the 1940s, and passed away in 2006, after more than 60 years in tango. I came to know El Flaco Dany when the documentary Leyendas del tango danza was premiered, at the Marabú, not long ago, and his looks, the friendliness of his gestures and his charm attracted my attention: he seemed to be what in our neighborhood we would call a player. He is one of the dancers who are starred in a movie shot to pay homage to the great milongueros, produced by The Argentine Tango Society and made by Daniel Tonelli and Marcelo Turrisi. His real name is Daniel García, but we all know him as El Flaco Dany, an icon of the milonga con traspié throughout the world. A prototypical porteño, he was born in the neighborhood of La Paternal; today he splits his time between Europe and Argentina, more precisely, between Bucharest and Buenos Aires. Continue reading. Osvaldo and Coca Cartery are incredible dancers. Osvaldo does lots and lots of very interesting steps that I haven’t seen anyone else do. I recently revisited the Tango and Chaos web site and read how Osvaldo Cartery’s dance style is probably the closest thing to the legendary dancer Petroleo’s style in the milongas today. Find out more. Pocho y Nelly dance at El Beso milonga. Back in 1947, when he was 16, he practiced with other boys three or four times a week. Then he frequented the Club Patagones, on 200 Quilmes Street, but soon later he dared to step on the huge track of the Club Estados Unidos or of the Franja de Oro. «Nearly always some dancers arrived and taught us steps and corrected our mistakes. From my neighborhood, Pompeya, I especially remember Tin who danced to Aníbal Troilo’s music with his partner Sarita ». Later he became habitué to the Club ANBA and thereafter to the Club Oeste, where he would really learn this art. With the passing of time he stood out in tango and even more in milonga. He teamed up with Nelly (Nélida Fernando) and began a career with classes, exhibitions and international tours. Soon he achieved recognition and his name turned out a synonym of elegance and cadence. Read more. Alberto Dassieu & Paulina Spinoso dancing vals. He had a so porteño destiny that he was born in the year the Obelisk was inaugurated. As a kid he used to dance with his mother and his aunts. «He was the favorite in the family», to such an extent that when he was nearing the time of wearing long trousers he entered the Jockey Club of Olivos. 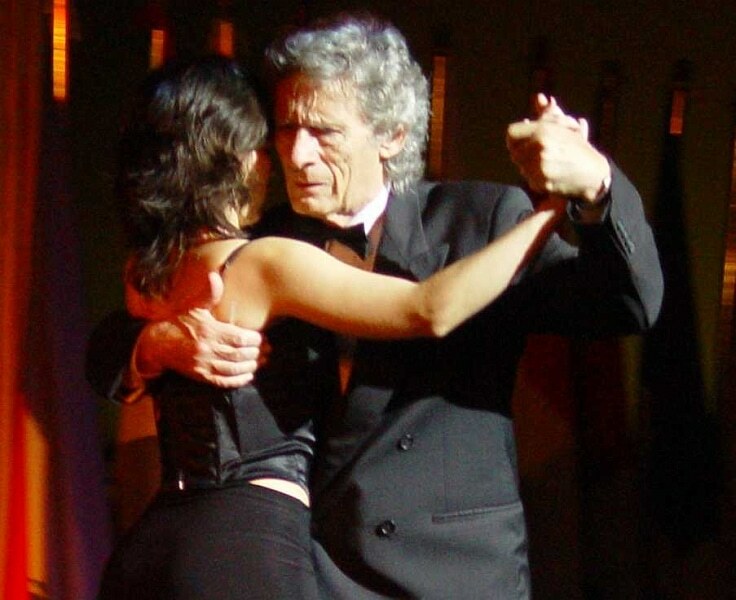 «I danced foxtrot, boogie, later tango, and I have never stopped since then». Later, at age 14, he went downtown and came to know Alfredo Gobbi, who became his dancing backer and allowed him to enter the Sans Souci dancehall on Corrientes Street. So then he frequented other milongas. 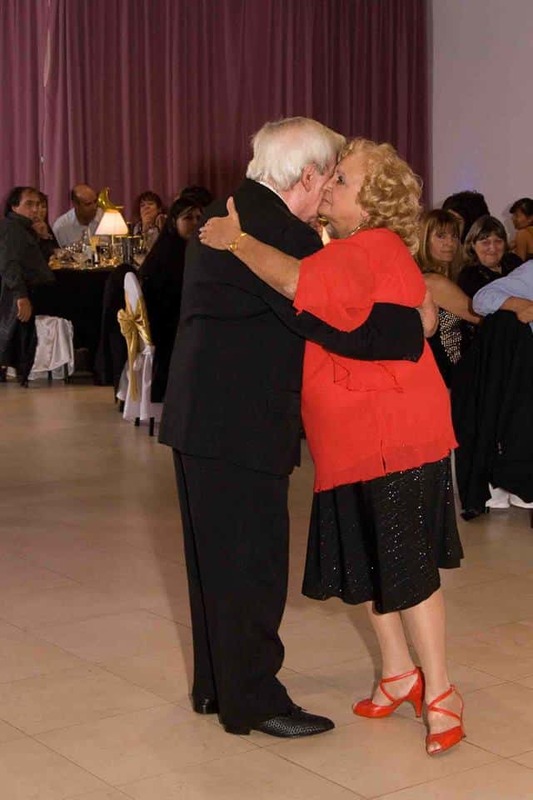 Among them we can mention the Galería Pronor on Maipú Avenue and the Club 12 de Octubre, both in Olivos; the Club Huracán in Villa Martelli and the Club Defensores in Florida, among others, «where people danced tango in the Pugliese’s style» and he developed a style that made him an expert in slow-paced tango. Continue reading. Myriam Pincen & Ricardo Vidort, 2004. An outstanding interview with a milonguera who has been dancing for 33 years! See her dance with the great Ricardo Vidort and what she says about dancing with him! These are Ricardo’s words a few months before his passing in May 2006. “Life is a beautiful thing if you know how to live it. We all try to live it, but we (milongueros) live in a different way for what we feel. You move with the grace that the music gives you, to dance the way you want to. We put that movement in several steps, and from those steps we can make 500 or more. Put feeling — that’s the secret of the tango. So you move and you hold the woman with strength but softly. She feels safe inside, and she feels that you are taking care of her. In that moment the priority is the music and the woman. I don’t care about the people. I dance before 3,000 people, and I dance for two. For me, it’s the same. I dance for my partner. I don’t dance for them. The feeling is unique like fingerprints. Nobody can teach you feeling. I can see it in your movements, and I correct that. I don’t correct what I want you to do, I correct what you feel in a better way so it’s your way, your feeling, your thoughts. Tango has a way, we call it close embrace. It’s very difficult for a woman, especially a foreign woman, to understand that a guy is going to put you here (on his chest). We bring our energy together in a close embrace, and our bodies enjoy the music. We try to move together, one helps the other to be in the music, one helps the other to do short steps, because we don’t need long steps. We need to walk like we walk on the street but with feeling. You can copy my steps, but you can’t copy what I feel. If I were to dance now, and I danced this tango, I wouldn’t dance the same way as in the video, because today it’s another feeling. And that’s what people need to understand. You can love ten people in your life, with passion or whatever, but it will be different with each one. That’s the secret of life.” Continue reading.